Is there a tool or method to analyze Postgres, and determine what missing indexes should be created, and which unused indexes should be removed? I have a little experience doing this with the "profiler" tool for SQLServer, but I'm not aware of a similar tool included with Postgres. This checks if there are more sequence scans then index scans. If the table is small, it gets ignored, since Postgres seems to prefer sequence scans for them. Above query does reveal missing indexes. Check the statistics. pg_stat_user_tables and pg_stat_user_indexes are the ones to start with. On the determine missing indexes approach....Nope. But there's some plans to make this easier in future release, like pseudo-indexes and machine readable EXPLAIN. Currently, you'll need to EXPLAIN ANALYZE poor performing queries and then manually determine the best route. Some log analyzers like pgFouine can help determine the queries. This will help identify tuples read, scanned, fetched. 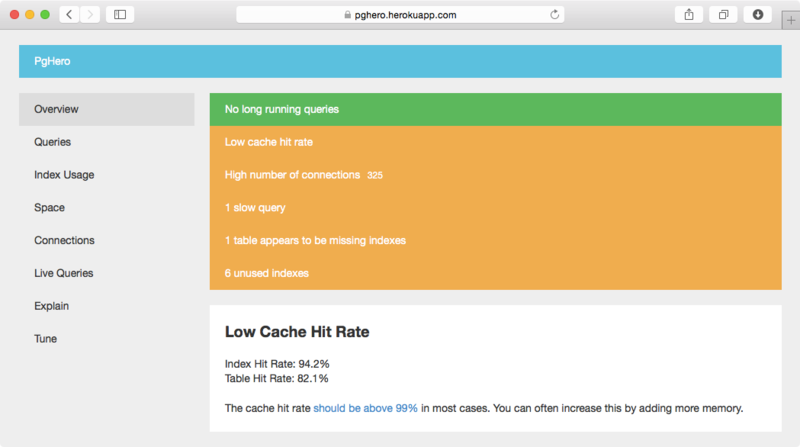 Another new and interesting tool for analyzing PostgreSQL is PgHero. It is more focused on tuning the database and makes numerous analysis and suggestions. There are multiple links to scripts that will help you find unused indexes at the PostgreSQL wiki. The basic technique is to look at pg_stat_user_indexes and look for ones where idx_scan, the count of how many times that index has been used to answer queries, is zero, or at least very low. If the application has changed and a formerly used index probably isn't now, you sometimes have to run pg_stat_reset() to get all the statistics back to 0 and then collect new data; you might save the current values for everything and compute a delta instead to figure that out. There isn't any good tools available yet to suggest missing indexes. One approach is to log the queries you're running and analyze which ones are taking a long time to run using a query log analysis tool like pgFouine or pqa. See "Logging Difficult Queries" for more info. The other approach is to look at pg_stat_user_tables and look for tables that have large numbers of sequential scans against them, where seq_tup_fetch is large. When an index is used the idx_fetch_tup count is increased instead. That can clue you into when a table is not indexed well enough to answer queries against it. Actually figuring out which columns you should then index on? That usually leads back to the query log analysis stuff again. Reference is taken from this blog. PoWA seems like an interesting tool for PostgreSQL 9.4+. It collects statistics, visualizes them, and suggests indexes. It uses the pg_stat_statements extension. PoWA is PostgreSQL Workload Analyzer that gathers performance stats and provides real-time charts and graphs to help monitor and tune your PostgreSQL servers. It is similar to Oracle AWR or SQL Server MDW. Not the answer you're looking for? Browse other questions tagged sql database-design postgresql or ask your own question.